William Henry Fox Talbot, a pioneer of photography, was born Feb. 11, 1800. Around 1834, Talbot discovered a way to sensitize paper with chemical coatings containing silver salts so that the paper would darken under the influence of light. His first images were simple photograms, made by putting an object such as a leaf on a piece of sensitized paper and leaving it out in the sun; he called these “photogenic drawings”. 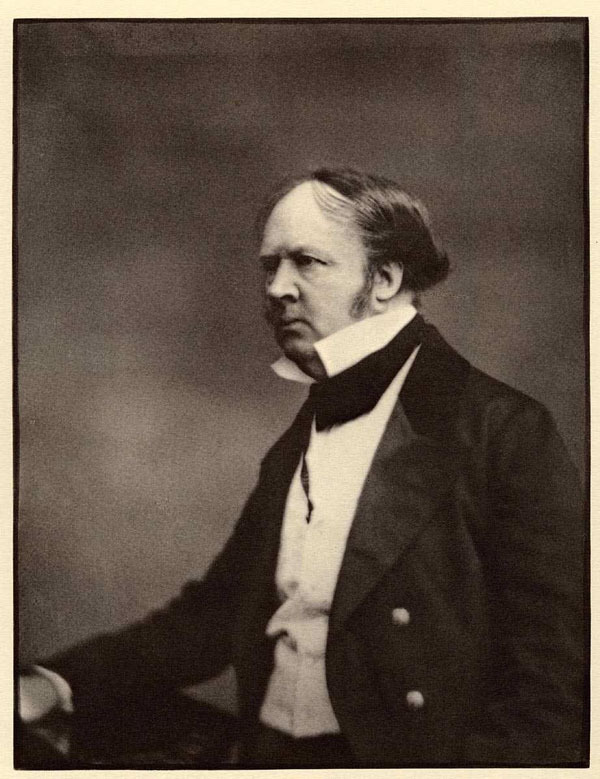 Talbot kept his work secret for 5 years, until Louis Daguerre announced his daguerreotype process in France, and then Talbot let English chemists such as John Herschel and Michael Faraday know what he had been up to; both photographic methods were revealed at a meeting in London in January of 1839. Talbot soon developed a new process, requiring much shorter exposure times, that he called a calotype. Daguerre’s process delivered a sharper image, but it was a positive image and could not be reproduced. Talbot’s calotype process yielded a negative, which could produce any number of positive prints. Talbot took a lot of flack because he patented his process and required royalties from professional photographers, but it is not clear why this was considered such odious behavior, when it had seemed acceptable for Josiah Wedgwood and James Watt to patent their inventions. Before long, it didn’t matter much; the wet collodion process, invented in 1851, made both the calotype and the daguerreotype obsolete in a hurry. Nevertheless, many of Talbot’s innovations, such as developing, fixing, and using a negative-to-positive process, remained staples of photography until the digital age. 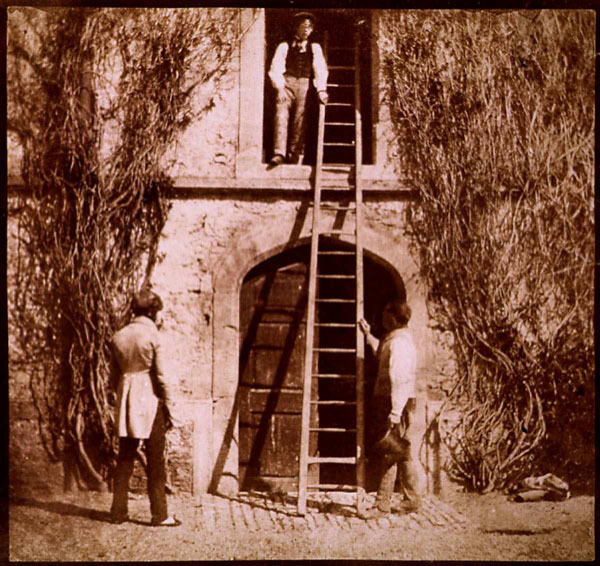 The positive prints made from calotype negatives were called salt prints; all of the images shown here are salt prints from Talbot negatives, and some are quite famous, and have names like “The Open Door” (first image) and “The Ladder” (second image). “Oak Tree in Winter” is of interest because we can see both the calotype negative and the salt print (third image). In 1844, Talbot issued a number of his prints in a book called The Pencil of Nature (fourth image); “The Open Door” and “The Ladder” were both included, as was a wonderful copy of a lithograph showing a bevy of caricatures of human faces (fifth image); Talbot wanted to show the potential of photography for copying art, a future not commonly envisioned in 1844. The photographic portrait of Talbot that is most commonly reproduced shows him sitting at his desk with his camera, glaring askance at the viewer. We show a different portrait, where he is glaring at someone other than us (sixth image).